Electronic signatures, eSignatures, are continuing to gain momentum in the clinical trial landscape. The immediate benefits of eSignatures are clear – your team can eliminate the printing of most regulatory documents, chasing signers, and scanning and faxing files. However, recent advances in purpose-built solutions employ eSignatures for far more than these basic benefits. Solutions in eRegulatory and eSource help you launch management tools like complete audit trails, task management, alerts, notifications, and file management all based around eSignatures. Of course, the number one question we get when introducing clinical trials sites to Florence eBinders is about eSignature FDA CFR 21 Part 11 compliance. While the FDA, and all the sponsors we work with, fully accept eSignatures, it is important to double-check that you are using them in a fully compliant way. These ten tips will help you get the most out of eSignatures while ensuring you remain FDA CFR 21 Part 11 Compliant. Every individual must have two unique identifiers, including a username and password. The organization must prove the identity of everyone given the ability to electronically sign documents. A password must be entered every time a document is signed. ie: the signature cannot be saved or auto-populate. Documents may not be signed in bulk. Information other than the signature can be auto-populated. Ie: username, the reason for signature, comments, notes, etc. eSignature tool that allows multiple people to sign the same document. An easy to access digital audit trail showing signer, a timestamp of signature (date and time), a reason for signature, and the version signed. Timing function: Built-in safeguards that do not allow a document to be signed before a pre-determined amount of time. When the audit trail is viewed this will prove that someone spent the amount of time necessary to read the document. Alerts: Email or dashboard alerts for when a signature has been requested and when a signature has been completed. 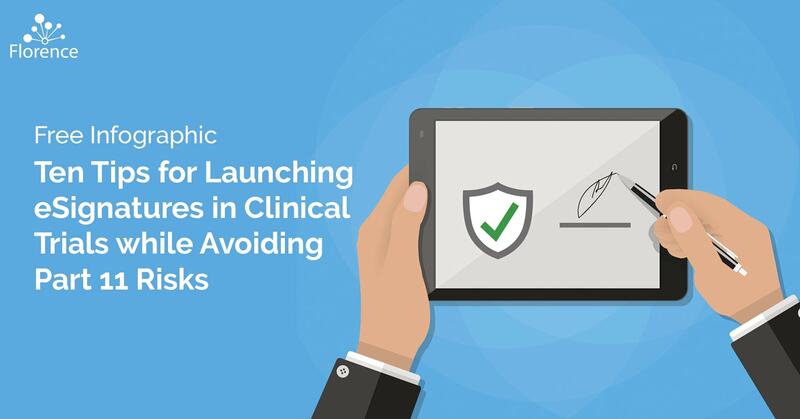 Launching eSignatures into your clinical trial workflow introduces significant time-saving benefits, however, it is vital that you ensure the system and processes you use are fully compliant and secure. Our team can help you do a quick analysis of your current processes to identify potential risks, as well as introduce you to innovative solutions used by the leading research teams.